I decided to go with the Zimarra, as you may have guessed, and hope to someday sew the cloak as well. Its been 3 and 1/2 days since the start of the challenge. All major pieces have been cut out and the body of the both the lining and outer layer have been sewed together. I used the machine for those bits. I plan to embroider trim along the sleeve opening and front opening and collar before I do any more assembly. I've been toying with different types of trim I could do, couching, beading, applique, embroidery.... think there might be all the above by the time I am finished. I'm kinda just winging it as I go. 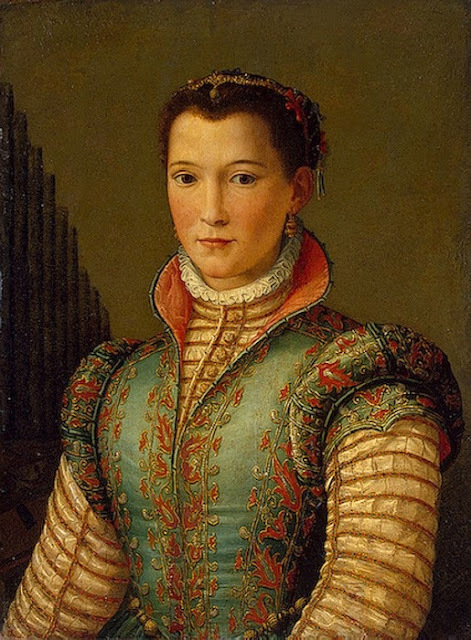 The portrait I'm taking most of my design from is Alessandro Allori's 'Portrait of a Woman' dated somewhere between 1580-1590.